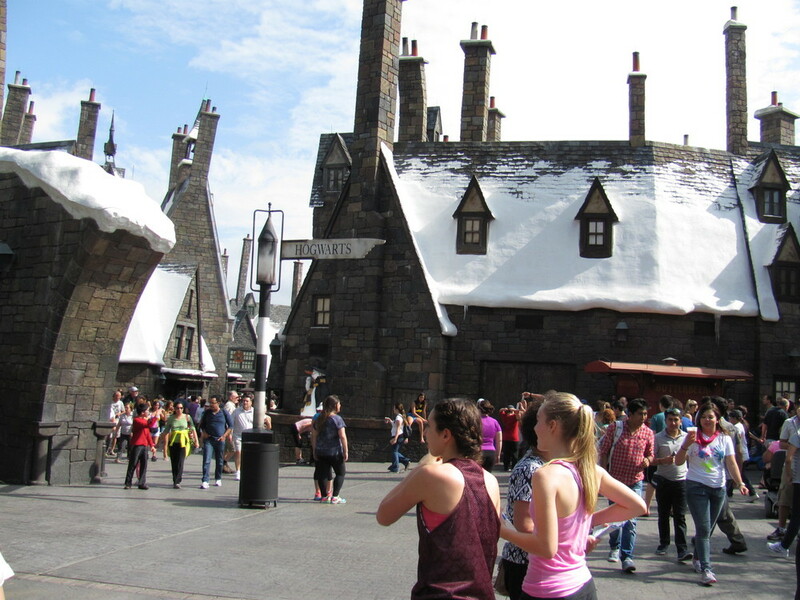 We had just one abbreviated day available for Universal Orlando which we wanted to spend at The Wizarding World of Harry Potter. Be aware that during off-season the park closes earlier at 7pm (ticket cost is not reduced). February 5, 2014: Some of our family converged on Orlando from three paths across the country to spend a few days together at Universal Orlando Resort and Disney World (featuring a scuba dive at DiveQuest in Epcot). Scheduled to all arrive in Orlando on Wednesday morning within minutes of each other about 9:30am, our plan was to spend that day at The Wizarding World. The stars were aligned, our flights miraculously arrived on time (in spite of the fact that two of the three flights were on U.S. Airways). We decided to check in at the hotel, Floridays Resort Orlando, later and go directly to the park from the airport. Our first minor hurdle was finding the path to the parking garage where our Budget rental car awaited (a Fastbreak reservation let us bypass the counter). But that involved finding the correct Orlando airport terminal exit to the parking garage—the signs were not as helpful as they should have been (cross to the parking deck at street level, not the overhead walkway; there you'll see an escalator to the rental cars). We meandered our way to the right place eventually. Budget had a brand new Ford Fusion Hybrid waiting for us. I had to discover that the car was started as soon as I pushed the button. There was no startup noise because it was in electric mode. Duh. I love Fusions but this was my first time behind the wheel of the hybrid version. I was disappointed at the relatively low fuel mileage we got from this hybrid (less than 30mpg for the 80 miles we put on it), but the car itself was great. On our way to Universal Orlando my GPS proceeded to direct us to what turned out to be Universal Studios in California. As we drove down the toll road my wife commented that the place we were passing off to the side looked like Universal Orlando. First note: remember that you are going to Universal Orlando. Universal Studios is just one of the theme parks and not even the one we were going to. An embarrassing correction to my GPS selection and a long detour later, we made it to the parking deck at Universal Orlando. That was the beginning of our first surprise...discovering just how far the walk is from the parking deck to the Wizarding World. The walk from the far end parking lot (we just followed the people directing traffic) to the Wizarding World of Harry Potter is over a mile, then that distance again for your tired return at the end of the day. We discovered on the way out that you can pay extra and get somewhat closer parking on the large parking deck, but difference in walking distance is relatively minor. See the Google satellite view at the end of this article. Universal Orlando seems to practice stealth ticketing. When entering Disney World there is no question about where to find the ticket booths and those booths are big and very obvious. 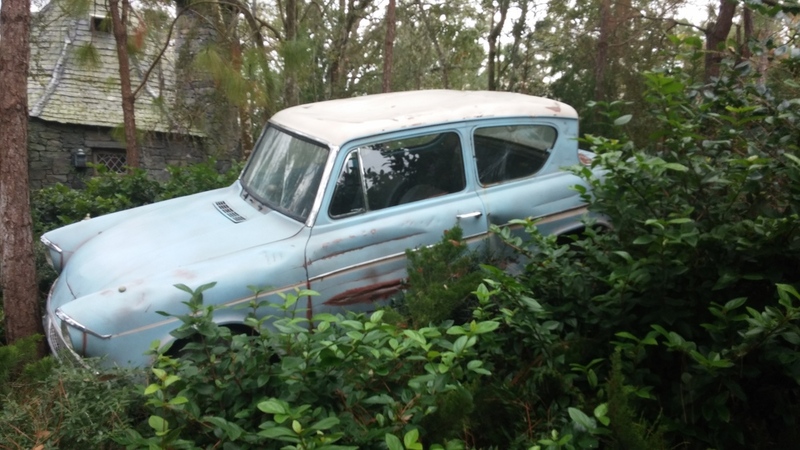 But walking in to Universal Orlando there is some uncertainty about the path to take and we never really knew when we were about to arrive at a ticket booth or park entrance. In fact, I never was clear at the time about how we would have gotten to the other theme park had we wanted to. We selected the right path by luck but didn't know that until after an unexpectedly long walk past shops and restaurants. Look carefully as you walk and you'll eventually come across a tiny ticket booth with a single slow moving line. We could have easily walked right past it. 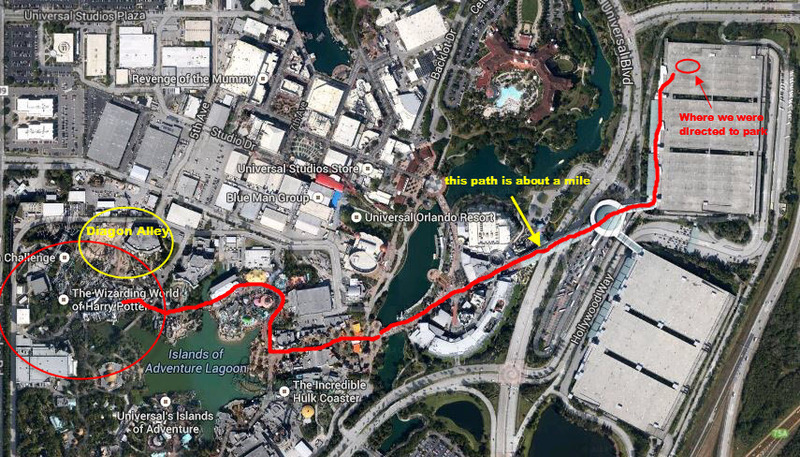 See how far the walk is from the parking deck to the Wizarding World. Notice that the Diagon Alley addition will not add a lot to the Wizarding World. Dragon Challenge: I love this roller coaster. Except for its theme it is identical to the Wild Eagle at Dollywood. It swoops and soars smoothly giving a serious feeling of flying, unlike the head bouncing jerky roller coasters that ride on top of the rails. Honeydukes: I had to get a Chocolate Frog, Every Flavour Beans, and Pumpkin Juice. Dervish and Banges for theme park priced merchandise out of the books/movies: a replica of The Monster Book of Monsters, Quidditch equipment, school robes, etc. Ollivanders: let a wand of various wizards pick you for $33. We also waited in a line (about a half hour for us) to watch and actor play Mr. Ollivander doing a wand choosing with a member of the audience. It was ok.
Butterbeer: One of the surprising delights was a frozen Butterbeer. Definitely go for the frozen (like a slush). Delicious and it hit the spot after long hours of walking. Three Broomsticks: We enjoyed a hearty Great Feast Platter, a platter for four that includes fresh garden salad with lite vinaigrette, rotisserie smoked chicken, chargrilled ribs, roasted corn-on-the-cob, roasted potatoes, and mixed vegetables (broccoli, carrot, and red pepper). The food was good and plentiful, enough for a couple more of us. Harry Potter and the Forbidden Journey at Hogwarts School of Witchcraft and Wizardry: This was a fun ride with seamless changes from live scenes to video views that place you on a broom flying around Hogwarts, London, and other environs. The two-person carriage that swings, turns and twirls you through this adventure gives a pretty cool ride. But the combination of unpredictable and sudden movements together with virtual video motion can trigger mild (for me) nausea, but I thought it was well worth the experience. The path to the ride (which also serves the waiting line if it is a crowded day), takes you through Dumbledore's office, the Defence Against the Dark Arts classroom, the Gryffindor common room, and the Room of Requirement. As we walked along Hogsmeade avenue we got to see the ladies of Beauxbatons Academy of Magic and the mighty sons of Durmstrang Institute on their way to a street show and photo op. Most of the store fronts are just façades. We were surprised at how few places were real and open to exploration. When Diagon Alley opens this summer there will be more to see. But looking at the space available for it and the description of what will be included, it seems it will be an incremental "more of the same" addition. More disappointing is that you will be required to have a multi-park pass in order to visit both parts of the Wizarding World. That seems pretty ridiculous. I suppose I'll have to go again some day to find out...but I'd better not go without our youngest Harry Potter loving daughter.